1TB Seagate ST1000DM010 Barracuda 7200.14, SATA III - 6Gb/s, 7200rpm, 64MB Cache, 8ms, NCQ, OEM is rated 4.9 out of 5 by 18. Rated 5 out of 5 by HowardTGS from Excellent products from top-flight company I have been doing business with Scan International for over 30 years. They have always provided superb customer service and technical support, as well as excellent value for money. I have often used the Today Only feature and saved even more. I can recommend them without hesitation. Rated 5 out of 5 by SammyBoi from Solid Job Needed a quick hard drive replacement but didnt have the cash to go SSD. Worked without issue, good price and still preforms great being mechanical. Rated 5 out of 5 by Bageder from Working Perfectly Reliable brand. Fast specification - obviously not as fast as solid state storage, but much cheaper. Straightforward to install. Needs a serial cable and power connection (not supplied with the disc). I'm a fairly heavy user, and the disc is now working perfectly in a desktop machine with Windows 10 Pro installed. I'm fully satisfied with this purchase. Rated 5 out of 5 by AlPal66 from Replacement hard drive I replaced a 2TD drive, which I had served me well for around the best part of five years but had started to have problems, with a 1TD (due to change in storage requirements) of same make and range. It maybe fives to make the physical swap, and another five to set my partitions up. Data transfer from backups took a tad longer but I'm very pleased with the end result, and wouldn't hesitate to use Seagate Barracudas again (or Scan). Rated 5 out of 5 by Bart40 from Great price and fast Old 500gb drive dead so replace with new 1tb for same price and is faster. Rated 5 out of 5 by Costel from Hard Drive 1TB Excellent Hard Drive, High Performance and great value for money. Rated 4 out of 5 by Alwayswiththehills from Great Drive until it fails...read on... Had one of these (older version) on the Scan PC that I had built for me. It was great until it failed; that is intermittently the drive would drop out of the boot sequence. I downloaded the Seagate software to check it out and it was not repairable, and was getting worse. Fortunately I have a good backup routine going so lost no data. Bit the bullet and went for the newer version. It was an easy 20 min job to swap drives over and configure the new one. Then copy the backup data back over. It has been running brilliantly since. Only a good for quality and overall rating as I would have expected a drive to last longer than 3 years. I ordered this the day before Christmas Eve and it was DPD delivered to a shop near me before mid day on Christmas Eve. At a time when Royal Mail lose parcles this was highly impressive. Well done SCAN. 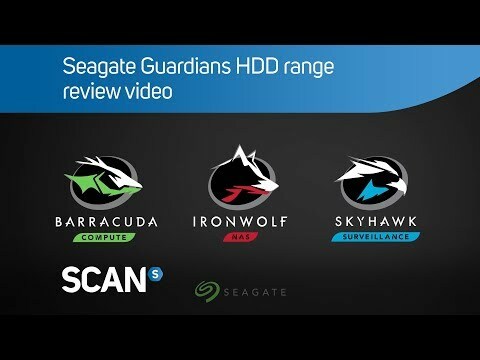 Rated 5 out of 5 by Jwatkins456 from Excellence that we have come to expect from Seagate. The ‘go to’ 1tb 7200rpm HDD for me, great quality, great price, great value.